2 Special Service Battalion was founded on 1 May 1946 at Potchefstroom. The sole purpose of 2 SSB was to train members of the Permanent Force as Infantrymen. 2 SSB was put into service officially on 21 February 1947 and on 26 January 1951 the name changed from 2 SSB to 1 South African Infantry Battalion (1 SAI). 2 SSB can thus be seen as the founding unit of the South African Infantry Corps. 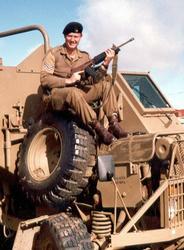 C-Squadron of 2 Armoured Car Regiment was founded during February 1962 with its official base at Zeerust. On 22 December 1966 the name was adapted to C-Squadron 1 SSB. On 1 October 1973 2 SSB, born from C-Squadron 1 SSB was resettled. The headquarters of the Regiment as well as C-Squadron 1 SSB was stationed at Zeerust, while D-Squadron 1 SSB was detached to 2 South African Infantry Battalion at Walvis Bay. Several squadrons have taken part in the war in Namibia and Angola since 1974. From 8 October 1975 to 31 January 1976, B-, C- and D-Squadron took part with distinction in Operation Savannah. This border duty was continued with significant participations in Operation Protea, Daisy, Hooper and Modular. 2 SSB is proud of it’s fighting record and commemorates the members that fell in battle with respect. Their remembrance is perpetuated on the memorial needle that was erected on 2 October 1997 at the base. The unit’s colours was handed over by His Honourable, the State President, Mr Marais Viljoen to the unit on 21 November 1980, during which the right of Free Admission to Zeerust was also received. The background of the colours is dark blue and the binding, cord and tassels in orange and silver. It represents the colours of the unit, as well as the Armoured Corps. The Unit’s Emblem (Sugar-bush) is placed in the middle of the colours with the unit’s motto directly underneath – “Agere Victoriam”, that is Strive for Victory. Africa to receive the Right Of Free Admission to a coloured community, namely Henryville. On 10 February 1988 2 SSB took part in Operation Adding during which President Lucas Mangope and his government came into power again, after a failed coup d’etat. 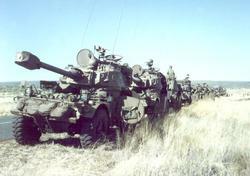 In May 1990, 2 SSB received the first Rooikat Armoured cars and on 30 June the National Colours. On 6 January 1992 the last compulsory National Service intake started and in June 1992 the training of two Squadrons of the first Black Voluntary Term System intake started. On 1 April 1993, as part of the reduction of the SA Army after withdrawal from SWA- Namibia, 2 SSB underwent a change in role. 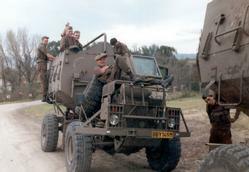 The unit was transformed from an Armoured Car Regiment to a Motorised Infantry Battalion and provided with an operational company (A-Company) which was transferred from Group 20. An Intelligence Corps platoon (Portuguese that were earlier part of 32 Bn) was also transferred from Group 19 and used as infantrymen. 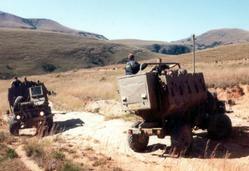 At this stage the unit did border protection operations from Nietverdiend and Nooitgedacht. The unit’s emblem, colours and motto was retained. 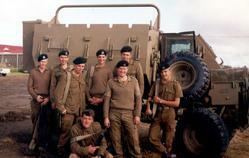 In January 1994 B-Company was trained from a Black Voluntary Term System intake. During the historical General Elections of 1994, 2 SSB took part in Operation Baccarat (stability in Mmabatho and Passado (border protection) as a peace force to ensure stability in the North West Province). On 19 December 1994, the Bophuthatswana Defence Force Parachute Battalion at Gopane was placed under operational command of 2 SSB, as part of the founding of the SANDF. 2 SSB withdrew simultaneously from Nietverdiend and Nooitgedacht. From August 1994 to 15 June 1995 successful bridging training was provided for 550 formerly non-statutory force members. By January 1995 so many troops had resigned that A- and B-Company had to be reorganised into A-Company. In February 1995 a new B-Company was formed from the parachute members of the former Bophuthatswana Defence Force (ex-Gopane base). 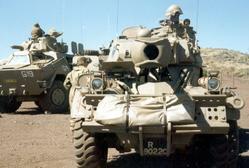 C-Company was activated later that year with former Transkei Defence Force members. 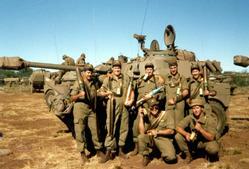 This combination made 2 SSB the first unit of the new SANDF that was composed non-ethnically. From middle 1995 these companies were deployed operationally nationally. This unit has since performed operational services in Mpumalanga, Kwazulu Natal and the Western Cape with an outstanding record. Early in 1997 the rationalisation of the Defence Force was announced and 2 SSB was one of the battalions that had to close down. The order was that 2 SSB had to amalgamate with 10 SAI on 1 April 1997 in Mafeking. Only a close-down headquarter remained with the order to close down the unit on 30 November 1997. Zeerust Commando was also moved into the base in July 1997. 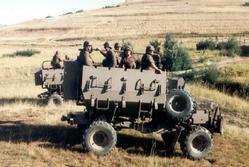 During July 1997 the decision was made that 2 SAI Battalion would be moved from Pomfret to Zeerust. 2 SSB was closed down on 30 August 1997 after the handing over of the base to 2 SAI Battalion. 2 SSB’s colours and Armour era memorabilia is laid down for viewing in the Armour Museum in Bloemfontein.